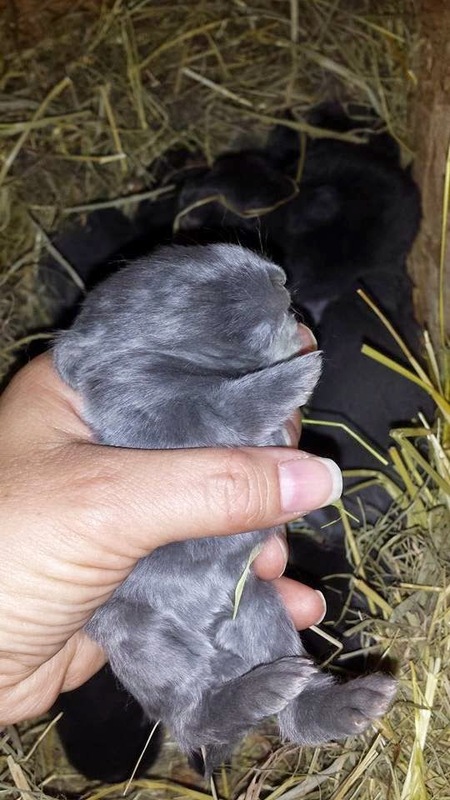 Dinie's Tangled Threads: Homestead Planning and new rabbits. Homestead Planning and new rabbits. Today I want to go over what are planning for next year. This year has been a little slow for us and we didn't have the money to go too many ventures up and going. Just getting the house in order took time and money for us. But it is coming a long nicely. I know that normally winter is for planning, but I wanted to discuss the animals that we are hoping to have next year. I've been looking into the chickens and goats more lately. I found that most if not all of my neighbors have chickens. I can hear them crowing all during the day. I can hear cows from down the street and sometimes I hear and see a horse or two. I really love living in the country. The air is pure and most days the sky is clear and blue. Today is a little overcast, but that's ok.
My nearest neighbors (You can just see their house in the picture of my garden) have silver laced wyandotte chickens and they sell those at Runnings in town. Now I have to decide if I want to order the goldens or just get the silvers. The goldens must be ordered online. Althuogh, I've been looking more and more at a dual purpose heritage breed. Such as the Dominique. They aren't beautifully colored like some, but they have great personalities, tolerate the cold and lay the large brown eggs. I'm almost talking myself into it here. LOL. Plus, they have hawking pattern so I could free range them without too much worry. I also found a grain elevator in another town closer to me that sells chickens for cheaper than Runnings. So, Runnings is out of the running for Chickens in the spring. HA HA HA.Even though I may have to order them online to get the Dominiques. Also, DH and I have been discussing enlarging my garden for next year. We did get some produce from the garden this year and it is still going into the fall. However we want to be able to get more for the amount of work that I am putting into it. We have a strange shape planned for next year, but it may be ok. We have trees in the way and he doesn't want to remove them yet. I do because they are just box elder trees and will eventually block the shade. For now, I have acquiesced to his request of not chopping any more trees down this year. (Personally, I think he and I are both tired of clearing and burning trees and shrubs.) This is a picture of what we currently have. It's from the back of the house looking toward our dirt road so you can see the little box elder trees we're debating about. We have the rabbits and that is going well. I am planning to slaughter one in a week or so and will probably do a post on that as well. I'm planning a slaughter station/house for sometime next year after we get chickens as well. 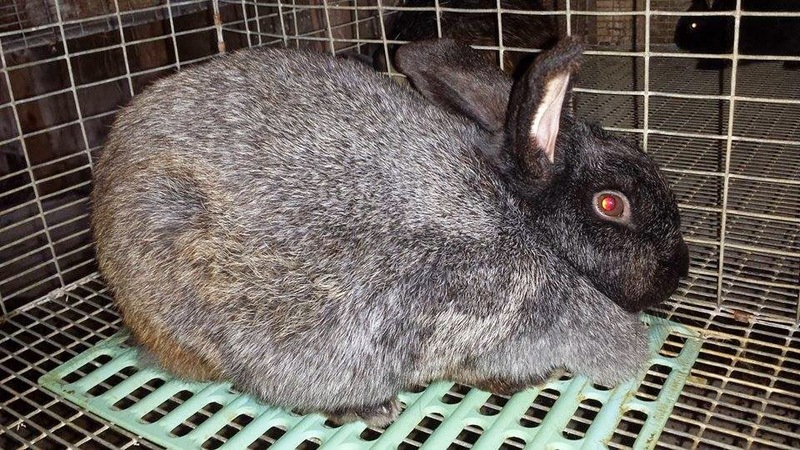 Rabbits do not require much at all. My doe should be kindling this week sometime and I am excited to see how many she has and what colors we can get. I'm really hoping for a chocolate dutch bunny. (Sounds a lot like a piece of candy doesn't it?) I am actually expecting blue and black though. 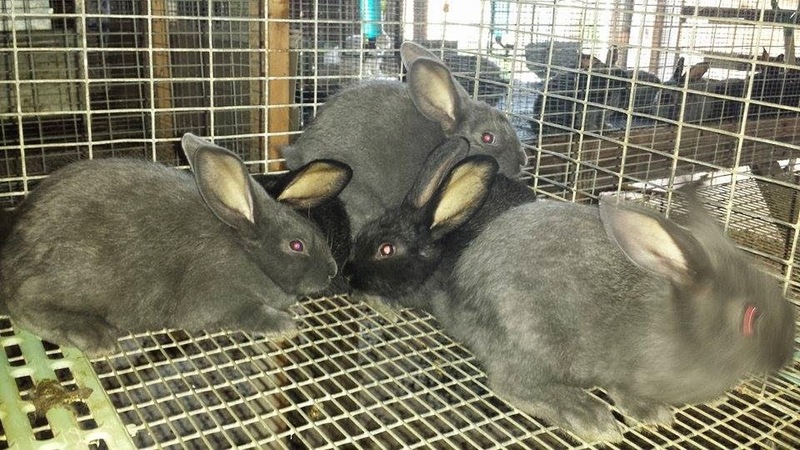 My silver Fox Rabbits are going to be coming home with me in about a week as well and I'm excited about that. The lady sent me a few pictures and here they are in their old home. I'll get new ones of course, but they are still small in these. This is the senior doe. She will kindle first for me I hope. This is a junior doe and she will not come into her breeding until after the ones that the sr doe has are ready to butcher. She should do nicely for me. Plus she is young enough to get used to my schedule. This is a blue baby boy. He's bigger now, obviously, but wasn't he cute? This is an example of the blue color that I am going to be trying to breed. The buck on the left (or maybe it is the back) is going to be our buck. I am still on a waiting list to get another buck from a different breeder to have some more genetic diversity. You can see the difference between the black and the blue in this picture. 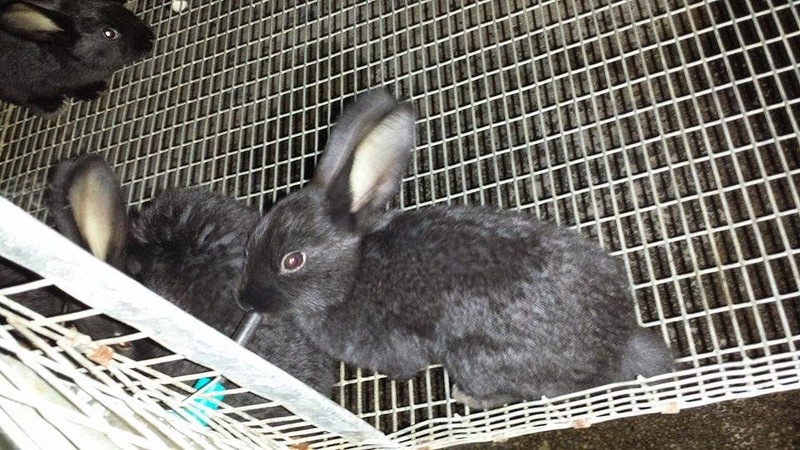 I've been thinking about trying to look into sustainable feeding practices for the rabbits I currently have. I'm not sure how this would work out in the winter time, but I don't like depending on a big box store for food for my food. If you know what I mean here. I hope to get to this and tell you more about it later. We have been planning a chicken coop for the spring and will probably get a run attached to it after we obtain the chicks. I have thought about ducks, but with chickens I'm not entirely sure yet. What would the point be really? I want to be able to grow all our own meat for the year and I am still trying to figure out how much we need and what varieties we want. We do not eat a lot of pork, because DH doesn't care for it too much. But, being a southern girl I like it at times and I would like to butcher at least 1 hog a year. That would give us enough pork for the whole year I think. My Mom and step father usually do at least 2-3 a year, but they eat more meat than we do. I can make 1lb of sausage last for 6 meals for 2 people. So, maybe just a few feeder pigs every few years or so would work out for us. But then, that's not sustainable is it? And that is something that I am striving towards as well. I'm excited to have geese in the spring as well. I'm thinking of forgoing the turkey for goose. I like the flavor of goose better anyways, and it's not so dry. (Unless my DH relays his need for turkey I doubt we will have any. Although if he does I can just shoot some wild ones around here.) Have you seen a goose egg? I could scramble one and have breakfast for DH and me both. I doubt we will get too many of them, but it will be a nice change once in awhile. Bees are on the list for us. I have requested a bee hive be built in the "man cave/shop" and he has agreed that we need them and a bat house to eat the mosquitos. We live on land with a swampy area so we really feel that it would help us to not get carried off or get the malaria either. We have entertained the idea of raising tillapia in the shop/man cave as well, but do not know how much space that would require and what the heating requirements on that are gong to be either. When the temperature gets down to -40 I don't want my fish to freeze, even if they are inside. They need to be at least 60F at all times. I found a resource that says that you can breed them inside in a 55 gallon tank. Which I would have to put in my basement. but to grow them out you need a larger tank. And that is the point that I get stuck on. Maybe sometime in the future I can build a larger barn and have it heated as well. We have decided on Kinder Goats and I am thinking 1-2 years on that investment. Milk and meat plus a free comedy show everyday! So in having these animals I will get all this. Plus, fertilizer for the garden. Cows- still thinking about doing a beef steer every few years or so.